In the wake of disappointing financial results, Sussex-based Quad/Graphics Inc. said Tuesday it will begin closing plants and taking other steps to cut $100 million in costs. “Our third quarter financial performance was challenging and below our expectations,” Joel Quadracci, CEO of the commercial printing firm, said in a statement. Quadracci said the company would move swiftly to slice costs and bring them in line with sales. Quad did not say how many jobs it might cut, or identify any plants for closing. However, spokeswoman Claire Ho suggested that the firm’s operations in Wisconsin, where it employs 7,000 people at 14 facilities, are not high on the target list for closures. 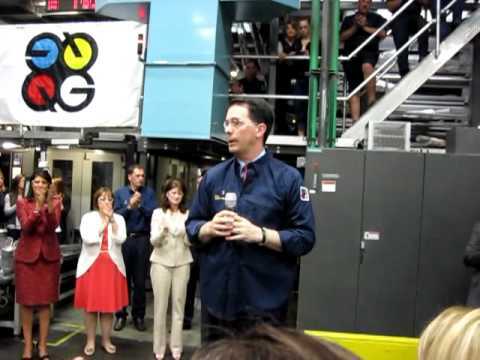 Quad continues to move work to its most efficient printing and distribution plants, and the Wisconsin operations are “among the most efficient platforms in the entire printing industry,” Ho said in an email. She said Quad is still hiring in Wisconsin. The company, the biggest printer of magazines and catalogs in North America, operates 57 printing plants in the U.S. and another eight outside the country. It employs 24,000 people worldwide. However, like other printers, it has seen demand dampened by the rise of the Internet and digital technologies such as iPads and other tablets. Tuesday, Quadracci said in his statement that pricing pressure accelerated during the three months that ended Sept. 30, while Quad’s manufacturing productivity declined. The firm’s sales for the three months ended Sept. 30 totaled $1.16 billion, down 6.5% from the $1.24 billion in third-quarter 2014 revenue. The company booked a loss of $552.2 million, or $11.50 a share, in the quarter. But that stemmed almost entirely from a $532.6 million non-cash, after-tax charge Quad recorded for “goodwill impairment” triggered by the decline in the firm’s stock price. Before Tuesday’s announcement, Quad’s stock closed at $13.10, down 18 cents. The company went public in July 2010 at $49. Its shares traded above $40 for almost a year, then plunged. They rebounded above $30 in 2013, but have trended downward for the last two years. The slide in the stock notwithstanding, Quad generates enough cash to pay a hefty dividend — at least at the prices of the last two years. The current dividend of $1.20 a year amounts to roughly 9% of Tuesday’s closing price. Quad on Tuesday declared another 30-cent quarterly dividend. The company also reduced its 2015 revenue estimates by about $200 million. Previously, Quad had estimated sales of $4.8 billion to $4.9 billion for the year. The firm now expects $4.6 billion to $4.7 billion in revenue. Since 2009, Quad has more than doubled its revenue, in large measure through acquisitions. Quadracci may disclose details of the company’s cutback plans this morning during a conference call with analysts. Quad/Graphics is an American printing company, based in Sussex, Wisconsin. It was founded on July 13, 1971, by Harry V. Quadracci, son of Harry R. Quadracci.